Sheriff Ryan Jones is used to getting calls about the odd dancing around the downtown fountain. 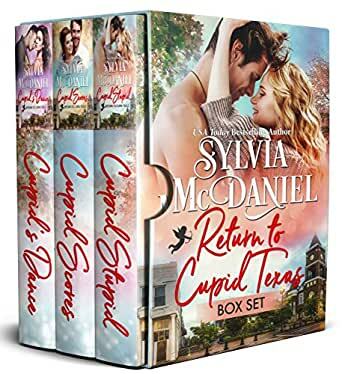 When you live in Cupid, Texas, there were always some residents who believed if you dance naked around the fountain, you were guaranteed to find your true love. What he doesn’t expect is to find the lovely, but spirited, Taylor Braxton confronting him at midnight – sans clothing. Unfortunately, a long-held promise and his badge stand between him and what he wants – Taylor. Three light, funny, happy stories. Fairly well edited. Three friends are reunited after some time apart. Over drinks, they decide to try out the town myth - dance naked around the Cupid statue at midnight and you will find true love. It's cold, the sheriff pulls up, and mayhem ensues. In Cupid Stupid, Taylor is picked up by Sheriff Ryan Jones. After cuffing her, putting her in the back of his cruiser, and giving her a stern lecture, he lets her off the hook and takes her home. Taylor isn't really looking for love - her fiancee cheated on her and married the other woman on the very day she decided to dance around the Cupid statue. Ryan has always had a little something for Taylor, even though he dated (and cheated on) her best friend. Ryan holds his teenage cheating past back, hoping to see if the little something can become a big something between himself and Taylor. Will Cupid deliver? Will Taylor take a chance on true love? What will happen when Ryan's secret comes out? In Cupid Scores, Meghan's run from the sheriff lands her in the front seat of her high school sweetheart's car. Max, an ex-NFL player, is the current football coach at the same high school where Meghan is librarian. They had a severe misunderstanding in high school that left them heartbroken and angry with the other person. Max is desperate to clear the air, get answers, and see if they can find their way back to each other. Meghan refuses to listen, give him answers, and is very hesitant to open her heart again. Will Max ever get the answers he needs? Will Meghan open her heart to Max? Will Cupid overcome the miscommunication? In Cupid's Dance, Kelsey's run from the sheriff lands her in the truck of her brother's best friend, Cody. Cody agrees to keep her midnight dance from her brothers, especially after his night rescue turns steamy. Cody and Kelsey begin a tentative dating relationship. Will Kelsey ever tell her brothers she is dating Cody? Will Cody be patient enough to wait out Kelsey's reluctance? Will Cupid give Kelsey a chance at love without her brother's interference? Will there be more 'victims' in Cupid's future? All three were light, fun, reads. Each of the girls keep their budding relationships a secret - from each other and the town. What happens when the truth comes out? Enjoy! If you run naked around the cupid statue at midnight you'll find true love. Three friends test the theory and find HEA. 5.0 out of 5 starsDoes Cupid really exist? Read and find out! Great series! Makes me laugh and want more!